Photographer Karthik Srinivasan, now a much talked about name on the advertising,fashion and celebrity scene, first grew an interest into the camera during his boyhood days at hometown Cumbum, which is a border town in Tamil Nadu, close to Kerala. The natural beauty of the landscapes around the young Karthik appealed to his photographic eye, and he used to shoot this natural beauty with his Pentax film camera at the time. Simultaneously, the Kollywood and Bollywood magazines at home seemed to be catching more of his attention with every passing issue – Karthik wanted to be a part of that glam! And not one to let his dreams turn to dust, the he soon found himself headed to Chennai city to pursue his love for cinematography. Around the ’95 time, Karthik approached the Chennai Film Institute with the sole purpose of getting a good training in cinematography. However, seeing his 6 foot 3 inch frame, most people readily assumed was approaching them for an acting or modeling stint! This started him thinking along the lines of modeling – and a last minute decision turned out to be a rewarding profession that would soon see him on the ramps during the Milind Soman days, climb the modeling ladder winning national contests…and he soon became a recognized face on the modeling circuits. Being the entrepreneur that he is, Karthik then started thinking – what next? And decided to get into the production line, taking Indian crews abroad and bringing foreign photographers and producers to India. Dreeamcast was born…Karthik recalls that his database of over 20 thousand models was maybe a little before it’s time “ print format portfolios were more in vogue then ”. However, Dreeamcast was a successful venture that brought him in touch with leading photographers & agencys of the time. One such photographer Michael Kenna realized that Karthik was quite inclined towards photography apart from his production capabilities, and spotting this interest, asked him why he didn’t try his hand at photography! 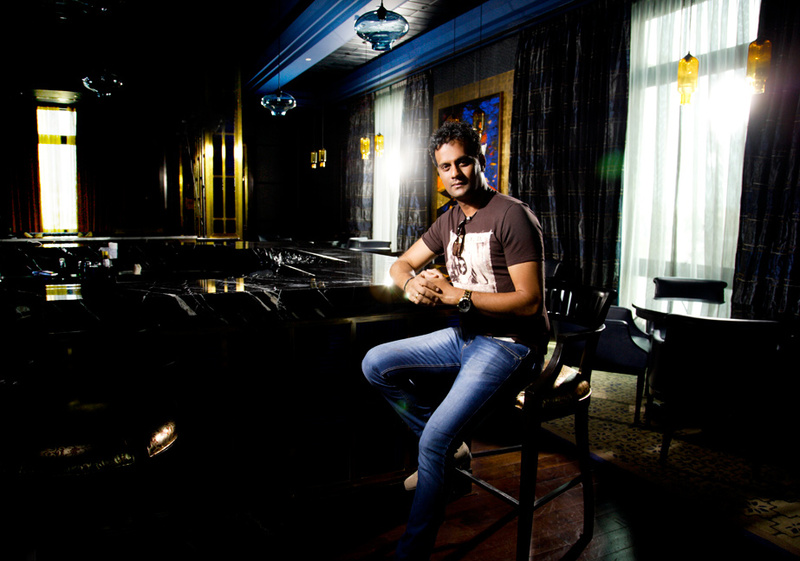 Today, Karthik shoots with the top celebrities of the industry, day in and day out. Some of the leading names to grace his frames are Akon, Deepika Padukone, Mahesh Babu, Dhanush, Anushkha Shetty, Vikram, Kamal Hassan, Suriya, Vijay, Madhavan, Mohanlal, Nayanthara, Amalapaul, Sneha, Shriya Saran, Bhoomika, Shruti Hassan, Priyamani, Namita, Tammanah and Anushka Sharma from the film world. Not to mention brands like Royal Challenge, Van Heusen, Basics, Genesis, Venfield, Samsung, HSBC, Standard Chartered, Weekender, MTV Clothing, Classic Polo, Samsung, Proline, Levis, Simply Sofa, Images Bazaar, Chennai Silks, Khazana Jewellery…the list goes on and also with leading advertising agencies like JWT,Ogilvy,Lowe,Mudra,Mcann,Opus to name a few. In fact Karthik has now become a celebrity of sorts himself, a regular on the page 3 events in the city. He is also a familiar face on Television, appearing on talk shows on TV as well as radio; he has given speeches at prestigious TEDX twice in one year and has shot for leading magazines like Vogue, FilmFare, Femina, Southscope, Galatta, JFW, Society, Etc.. Right now, Karthik is enjoying his shoots in Mumbai apart from the south advertising & celebrity shoots, looking forward to work with Bollywood celebrities and National brands. Apart from his work in India, Karthik also works for advertising agencies at Singapore, England, Thailand, Malaysia and China. Having come a long way now, Karthik recalls how there was no structured guidance available when he was a new kid on the block, looking to break into the industry circles that were a challenge to every newcomer. With a keen desire to give something back to the industry, and help youngsters of today – he recently has launched his own Photography Academy called the K's Academy of Photographic Arts (KAPA). Details of KAPA can be found in www.kapa.co.in. Looking at the dramatic change in the wedding photography market in India over the last decade. Karthik has set his sights on creative wedding imaging services through his latest venture Moonstruck. Today the consumers are very much aware of quality imagery, and will simply not accept substandard images of their special day. Today's young generation of brides and grooms are well aware of what a creatively designed wedding album can look like. So imagine what happens when a celebrity and fashion photographer sets his eyes on the wedding photography business? The brides and grooms take center stage where celebrity models belong, and why not? After all there is no one more important on the wedding day than the couple tying the knot. Details of Moonstruck can be found in www.moonstruckwedding.in. Apart from this, he also speaks at various colleges and takes seminars to encourage younger talent to dare to enter an industry that has often been looked on as something only for those with established contacts. After all, his career has proved that this need not be the case!